Published in Rafu Shimpo, July 14, 1960, Japanese section. 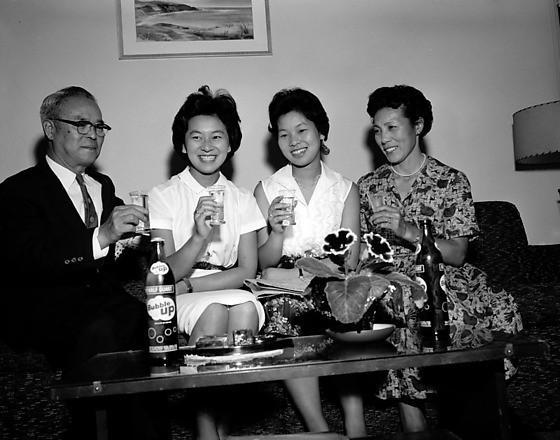 Noriko and Sachiko Ikeda, two daughters of Hayato Ikeda, celebrate news of their father's becoming Prime Minister of Japan with a drink Bubble Up soda at the home of Kazumo Matsumoto in California, July 1960. Two smiling women sit on a couch holding glasses of clear liquid in their proper right hands. They are flanked by an older couple, Mr. and Mrs. Kazumo Matsumoto, holding same glasses. Bottle of Bubble Up sit next to flowers on a coffee table in foreground. Typed on original negative envelope: Matsumoto, Kazumo Home -- Prime Minister Ikeda's Daughters. Kazumo Matsumoto was a junior high school classmate of Hayato Ikeda. Ikeda would stay at his house whenever he visited California. Ikeda's daughters were staying with the Matsumoto's.